If you are using a glucometer at home to check your blood sugar at your own convenience then you might have some suspicion about its usage and getting the accurate result. Some people worry about the time to measure it and some worry about the finger to be pricked to collect the small amount of blood on the test strip. Here you will get answer to such questions and it will help you in getting the accurate result at the comfort of your home. How to check Blood Sugar using Glucometer at Home ? Keep following things ready before testing. Glucometer, test strip, lancet (to prick your finger), cotton swab and a diary to note down the reading and time of test. Wash your hands, so that any sugar deposit on your finger tips won't affect the result. Load the lancet in lancing device. Put the test strip in the glucometer. It will turn it ON. Prick your finger with lancing device. Squeeze your finger and put a drop on blood on test strip. 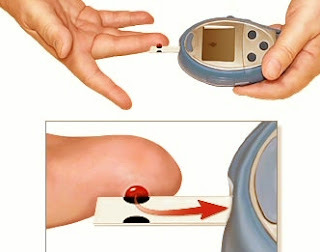 Within 10 seconds the glucometer will show the result. Clean your finger with the cotton swab. Note the result and time in your diary to keep a track of your blood sugar. Which finger is best to check blood sugar ? According to WHO middle or ring finger should be used to check blood glucose. You should avoid using thumb, index finger, little finger. Thumb and Index finger have comparatively more nerve ending and hence more pain in pricking. These nerve ending make our finger tips an ideal instrument to touch and sense anything. Any damage to these nerves by using a lancet is not recommended. For the same reason it is advised to prick your middle/ring finger on the sides, not on the main pad/finger tip. Little finger is not recommended due to less skin on it, and you might need to squeeze it more to get some blood out of it. There is no impact on result if you don't follow these recommendations but you might get more pain and some of your nerve endings may get damaged. All fingers carry the same blood, amount of nerve endings and skin differs. Should i wipe off the first drop and use second drop for testing blood sugar ? Usually it is recommended to wash your hands with soap and then dry them before testing your blood glucose. It washes away any external factor that can change the results. But if you have not washed your hand then you should wipe off the very first drop with impurities in it. Comparatively second drop will be more pure and will give accurate results. Squeezing the finger can also change the result sometimes. So to get the accurate results it is recommended to use second drop after wiping the first drop of blood with cotton and avoid squeezing if possible. Which time is best to check blood sugar ? There is no best time to measure your blood sugar. If you want to get the minimum blood sugar reading then you should check it hours after having a diet. Early morning time is best for that. If you want to get highest reading then check it just after having a diet. Blood Sugar is measured in three ways on the basis of their timing. These test timings are made to get the actual result and measure the amount of blood sugar rising in your body. So instead of searching for a time to get best result, check your actual reading and get the proper treatment if you are diabetic. Fasting: It is measured before having breakfast. This reading tells us about the minimum level of blood sugar in our body. Usually the time interval between dinner and breakfast is highest compared to any two diets. It makes the blood glucose level to fall down to its minimum limit. If this reading is between 70 to 99 mg/dl then it is a good news. Postprandial: Usually people call it PP Blood Sugar. It is measured 2 hours after having breakfast. If this reading remains less than 140 mg/dl then it is normal. If you are in hurry and measure it after 1 hour then it should be below 200 mg/dl. Random: Random blood sugar can be measured at any point of the day. 79 to 160 mg/dl is the normal range for random blood sugar. Just keep in mind the above two information given in above two measurement timings. If your random reading falls in those regions the most probably you are no diabetic.